To merely feel anger or become irritated is no more sin than to feel a toothache. Anger is a temporary reflex like pain and fear and has a legitimate function. By God’s design, we have no control over its arrival, so there’s no need for guilt. Willful anger or nursing a grudge is the sin. Just as we’re not designed to live in constant pain or fear, so we’re also not designed to function well in constant irritation. 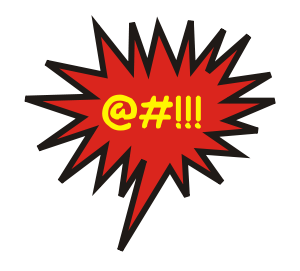 Anger’s only purpose is to alert us to an offended sense of “justice”—anything from being cut off in traffic, to a rude remark, to an outright crime, and everything in between. Here’s the key: The point of the alert isn’t to correct your neighbor or to put that fool in his place, but rather, to see if you can help him—not for his sake, but for yours. For example, it I can help my snippy co-worker by coming back tomorrow, I do so. If I can help the snotty cashier with one kind word, I do so. If I can’t help, I cansimply shrug off my anger alert and wish them well, even if I only do it in my head rather than verbally. What keeps it from being fake or superficial is that I’m doing it primarily for my own benefit. That’s what being “filled” is. The beauty is that my neighbors get the side benefit of my filling. Getting rid of willful anger is the #1 trick to blessing those who curse you, doing good to “enemies,” and our own personal well-being. Why? Because willful, retained anger always seeks to do harm to one degree or another. And that harm always returns harm—judgment—first from people, then from God. The primary benefit of Jesus’ seek-no-harm strategy isn’t for neighbors; it’s for ourselves. It isn’t selfish; it’s exactly why Jesus says to love your neighbor as yourself. The reason it “works” is because Jesus is the Master of human motivation and the go-to guy for real life. Notice that the motivation he uses in his lose-life-to-save-life approach isn’t to save others’ lives; it’s to save our own. Before you recoil in horror, notice also the result: both lives end up better off. However, it only works when we frame it in the context of good will for all. If it’s only good will for the self, it backfires. Nevertheless, the only way to get long-term success is for something to be “in it” for the individual: strength, well-being, joy, a sense of direction, life to the full. Scripture is loaded with these motivations! Thus, if I relent and let go of my “right” to be mad, not only do I un-sabotage my own spirit, I also un-sabotage my neighbors. Think what would happen if we dumped willful anger and contempt for our own sake. We’d see a corresponding, “miraculous” increase in neighbor love. Rather than self-serving, which many people incorrectly assume, it actually serves everyone. That’s the genius behind all of Jesus’ “backwards” teachings. We’ll look at the second culprit in the next installment, but in the meantime, what are your thoughts? Does God hold His anger? Was Jesus an angry person? Even if your neighbor offends God, how should you react? Awesome points. For me, the best ones to remember are 1) that initial anger and/or irritation is not a sin, 2) feeding them and holding onto them as “righteous” anger is the sin, and 3) releasing anger and contempt is initially for my own spiritual/physical health and development, which automatically radiates out to others. What I’m trying to learn how to do consistently when I get angry or disgusted are to first, pray for myself, and then, pray for the other person. Just knowing that God doesn’t intend us to be angry changed the whole game for me. That by itself made it easier for me…so freeing!